Turnip Greens — Cohabitate Co. Nothing says Southern like sheering turnip greens into a pot on the front porch. Nothing says "Bring on the good fortune" like leafy greens resembling dollar bills to bring in the new year either. We eat them year round topped with spicy pepper vinegar just too keep our good fortune going strong. They are delicious and nutritious on top of all that folk lore too. So pile your plate high and enjoy! First, sheer the leaves of your greens from the stalk. Then wash them thoroughly. Then cut your turnip root from the stalk and peal it. Wash it thoroughly as well, then cut the root into smaller pieces. Place your leaves and chopped roots into about a 4 qt. pot. Add your pecans. 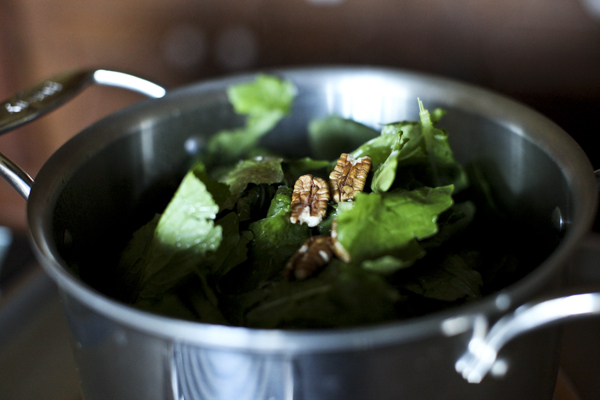 Pecans will take away some of the bitterness in your greens. Add olive oil, honey, and balsamic vinegar. Also add a generous amount of water to your pot. I will say about 3 in. to start. Cover and turn heat to high until greens wilt. Once wilted, reduce heat and cook for 1 1/2-2 hours. Continue to watch in case all water evaporates. Add a little along so that there is always some in the bottom of your pot. Then sit on your front porch with a big bowl of hearty greens and watch the cows go by.